In today’s Radio Astronomy, host Diego Casanova will be explaining super massive black holes and how they have captured the imagination of writers, thinkers and astronomers. Black holes of stellar mass or super massive black holes are caused when massive stars collapse at the end of their life cycle. 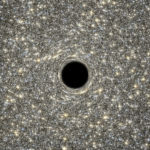 After a black hole has been around for a while it starts to pull in other mass and widen itself. 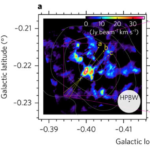 Areas closest to to the black hole contain a ton of radiation, thus making reflective light. Sagittarius A (Srg A for short) is a super massive black hole. Srg A sends mysterious flares once daily, a study provides a suggestion that there is a cloud around Srg A that surrounds it. This cloud could contains thousands of small asteroids and comets.